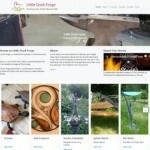 Little Duck Forge is a blacksmith business in the Portsmouth area. 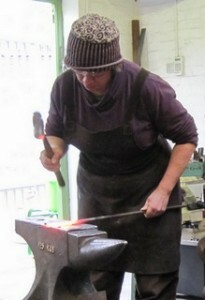 My name is Lucille Scott (Iron Maid), a qualified Blacksmith from the Hereford College of Technology.Little Duck Forge specialises in contemporary ironwork using traditional forge work techniques to create bespoke metalwork. A new website is currently being developed for the forge to show off the latest work in a more mobile friendly format, please visit the new site at [new site] and let us know what you think. The ram’s head poker is a classic forgework project encompassing a wide range of skills resulting in a beautiful finished project. Guest tutor Matt Hicks is brimming over with enthusiasm for this amazing craft and will bring the joys of blacksmithing to life for you. For further details on courses see the courses page More details …. Lucille combines the wonderful age old techniques of the blacksmiths craft with contemporary design and a modern aesthetic. Much of the inspiration for my work comes from living by the sea all my life combined with the construction and joining methods that feature so strongly in this ancient craft. Typically I work with a range of clients including architects and interior designers but particularly the business is aimed at private individuals who appreciate craftsmanship and have an eye for detail. Little Duck Forge work is bespoke and is made and fitted to the highest standard, innovative design and traditional craftsmanship are forged together. Most work is done to commission and I am always happy to discuss any projects or ideas.